The gate is latched from inside, but you can open it by sliding your hands through the grill. And over the far end of the courtyard sits the bearded sage. Like any Indian town, Gurgaon in the National Capital Region is full of temples. A great many tend to be devoted to Ram, Hanuman, Shiva and Durga. 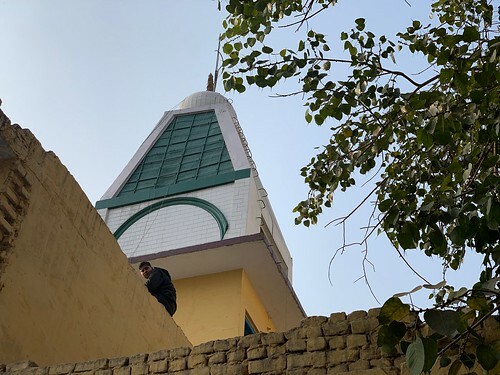 But here, in Sadar Bazar, stands a rare temple commemorating the mystical 15th century poet Sant Kabir. 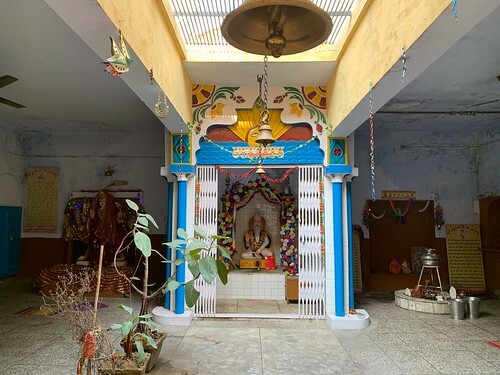 The courtyard also has shrines to Durga and Shiva, to be sure, but Kabir’s statue is placed in the centre, and only he has been given the privilege of a chamber. Built of white tiles and iron grills, Kabir’s enclosure has yellow flowers painted at the top along with a yellow sun depicted with an expressive face showing eyes, lips and nose. Slender blue columns and plastic flowers are other embellishments. 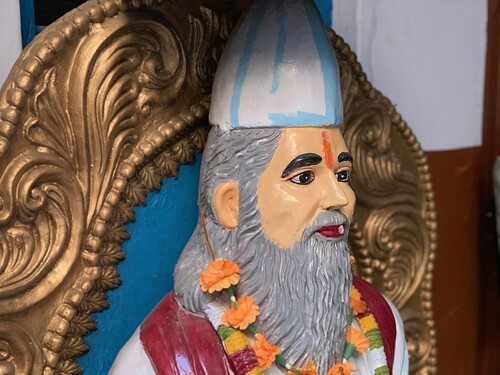 Dressed in white robes, Kabir is wearing a white cap as well as a pink scarf. This afternoon, the temple is empty but the air is filled with sounds of traffic. And yet, the place is dappled in serenity. A couple of wedding cards are lying about the poet’s statue, probably as an offering to seek his blessings for the marrying couples. The temple courtyard has rooms on either side. Their blue doors are half-open but the rooms themselves are dark and seem uninhabited. 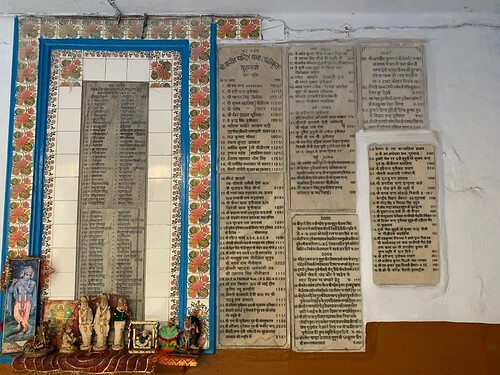 A wall is laid with marble slabs inscribed with the names of temple’s many donors—Shree Roopchand Advocate gave away ₹75,000 rupees and Srimati Champa Devi offered a curious sum of 2,121 rupees. 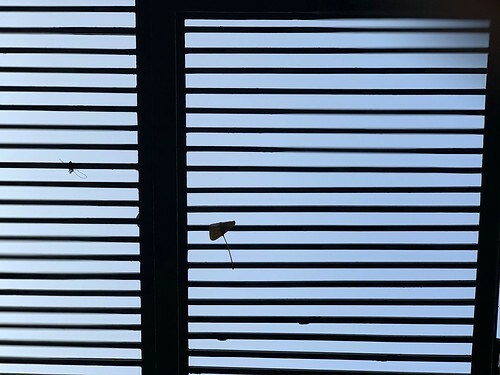 The central portion of the temple’s courtyard looks to the sky though a roof of grills— a yellowish peepal leaf is stuck in it as helplessly as a sailor drowning in the sea. 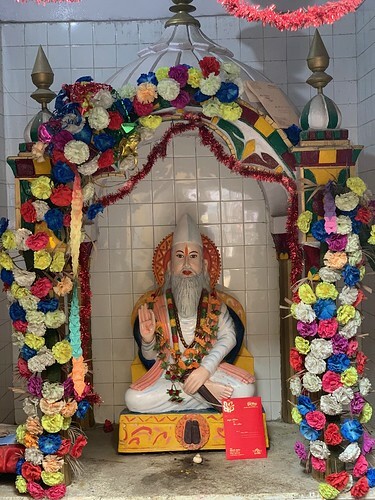 Before long, while wandering about the peaceful courtyard, you will spot a giant statue of Kabir beside the main door. Garlanded with plastic marigolds, it looks so lifelike that you half expect the still lips to break into a Kabir doha (poem). 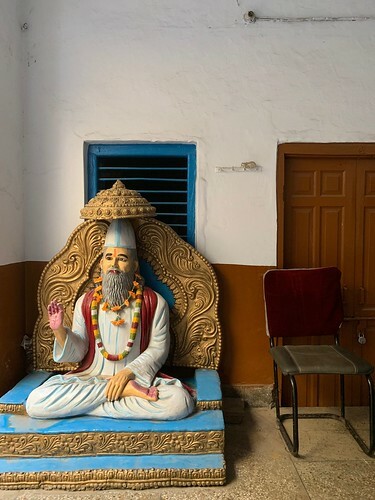 A chair is placed beside this statue, which of course is the ideal site to speed-read a volume of Kabir’s poetry.